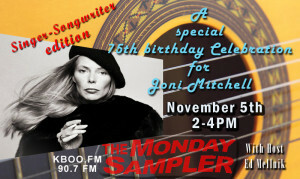 Join us for the 75th birthday celebration of Joni Mitchell with a special program of her music. KBOO's Ken Jones and founder of the Piano and Guitar DataBase on Joni's web site -Sue Tierney, will also join Ed to add some sweet comments. This article has been viewed 610 times since being added on November 11, 2018.